There are times when you feel angry and want to destroy everything that comes in your way. The destructive behavior might cost you a lot sometimes, but there is a game where you can let out your anger for free. Manormonster.io is a new fashioned game by IO games. The basic idea of the game is to abolish the whole shebang you come across. The game can be played by logging in and as well as a guest. The game starts with a monster or a man. You have to destroy other monsters, buildings and blocks. As this is an online game, there are people playing from all over the globe, those people will also attack you. You can shield yourself for a few seconds and get away from big monsters. You can collect man and monster coins around the arena and gain XP my eliminating the players. The coins are used to upgrade the monster. The aim is to gain XP to increase your level and reach the top of the score board. This game is very fun to play, as the game idea is quite unique. The time spent playing it will always be considered as a quality time. I hope the game brings as much joy to you as it brings to me. 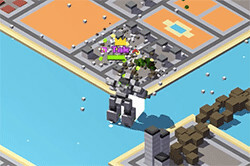 The game involves simple controls. Use the mouse to aim in a direction and left click to hit. Keyboard will also be used, Use “W, D, A, S” to move your monster around the map. Press Z to attack and X to shield your monster.